Defective tires can cause wrecks, injuries and death. Defective tires can cause major problems for drivers — loss of control of your vehicle which can lead to a wreck, resulting in injury or death. 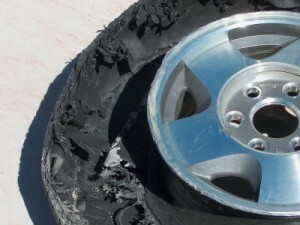 A blowout or shredded tire on a car or truck can quickly cause a rollover accident, frequently at highway speeds. Defective tires can be caused by poor design or manufacturing negligence. Tires may be designed in an unsafe manner. The plant where they are produced may not adhere to safety standards. The material used may be of an inferior quality. During the manufacturing process, foreign material may have been included in the mix, and ended up being manufactured into the tire. The tires may have been sitting in storage for months, or even years, becoming less safe as time goes by. The bonding materials could be poor quality. For such a vital component of our vehicles, tires seem to be susceptible to so many dangerous issues. If you or someone you know has been injured due to a defective tire, email the personal injury lawyers at Carr & Carr or call 1-877-392-4878. Talk with an Arkansas and Oklahoma personal injury attorney for a free consultation. problems caused by a permanent injury. Who Is Responsible For Defective Tire Accidents? An experienced personal injury attorney can lead an investigative team to help determine who is at fault. Was the problem caused by poor design? Then the tire’s designer should be help responsible. Was the tire poorly made? Then the manufacturer should be responsible. Did the distributor, retailer, wholesaler or reseller intentionally sell a product they knew was defective? Then that organization should be responsible. There are many questions to be asked, and a thorough investigation is the only way to find the truth.